The first prototype for McLaren's new carbon fiber chassis has been revealed. McLaren has unveiled the first prototype of its new carbon-fiber Monocell, the tub that forms the structure of McLaren’s cars, which has been delivered from the firm's new £50-million ($65 million) Composites Technology Centre in Yorkshire, UK, to its main UK-based production facility in Woking, Surrey. Codenamed PLT-MCTC-01 (Prototype Lightweight Tub, McLaren Composites Technology Centre, Number One), the lightweight chassis is the first step towards reducing weight across the company's model range to prepare for hybridization since hybrid powertrains tend to make cars heavier than their traditional gasoline counterparts. 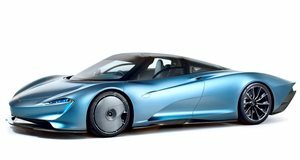 By 2024, all McLaren sports cars and supercars will be hybrid. Before McLaren’s first Monocell-based production model enters production in 2020, the first prototype tub will be subjected to extensive crash testing in Woking. McLaren’s Composites Technology Centre currently employs around 60 people, but this will rise to over 200 when full production commences in 2020. "The delivery of the first prototype carbon fibre tub by the new MCTC to McLaren HQ is not only an exciting day for everyone who has directly worked on the project but also a significant milestone for McLaren Automotive’s ambition to be world-beaters in lightweight and composites technology which goes hand-in-hand with our move to hybrid powertrains as part of our Track25 business plan,” said Wes Jacklin, Plant Director, MCTC, McLaren Automotive. McLaren has a long history with using carbon fiber in its cars, having first introduced the material into Formula 1 in the early 1980s with the MP4/1. Since then, every McLaren car has featured the lightweight material.